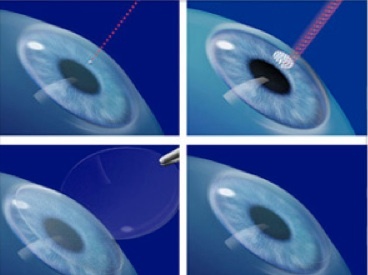 Intralase LASIK eye surgery is a revolutionary technology that makes LASIK procedure safer and more accurate. Here, computer-guided Intralese femtosecond laser is used to create the corneal flap as opposed to the hand-held blade that is used in previous methods of vision correction surgeries. Even though traditional LASIK method is already very safe, precise and effective, the Intralese laser makes it even more reliable, thereby reducing any risks of complications after the surgery. Intralase LASIK surgery follows pretty much the same procedure as traditional LASIK, only that a laser is used instead of a blade. An excimer laser is used to reshape the cornea in both cases. However, before this can be done, the surgeon needs to create a flap through which the inner portions of the eye can be accessed. This is where a major difference occurs – in the way the flap is created. Instead of using blades which are operated by the surgeon’s hands, computer-guided lasers are used, which greatly increases accuracy and safety, while reducing complications. In an Intralese LASIK surgery, tiny pulses of infrared lights are passed through the outer part of the cornea, where they are focused at a precise point in the stroma. Here, right below the surface of the eye, they form a layer of microscopic bubbles. Thousands of these microscopic bubbles are positioned precisely so that the dimension, the bevelled edge, as well as the location of the hinge can be determined. To complete the flap, the bubbles are stacked along the edge till the corneal surface. After this, the flap is lifted for the excimer vision treatment. After the treatment is completed, the flap is then closed and repositioned, which can be achieved in an accurate manner due to the bevelled edge. It is more accurate, reliable and much safer than previous LASIK surgery procedures, thanks to the computer-guided laser. Risks of complications are much lower after the surgery, and recovery rates are much better. This is because the flap is repositioned perfectly back into its place, leaving no room for complications. Results after the surgery are much better too, meaning that patients have a higher quality of vision.